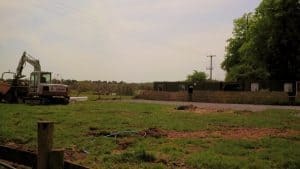 Work is now starting on our Straw Bale Bunkhouse! community. Moreover, our educational visits are growing each year. and inform the next generation and we want to do more. the community for the community. This straw bale bunkhouse is going to be constructed using environmentally sustainable techniques. It will have car tyre foundations, a Roundwood timber frame construction, and straw bale walls covered in clay and lime plasters, plus natural sheep’s wool insulation.